Do you agree with the statement that the best grain free dog food can fix many health-related issues with your pet? Have you ever tried this type of nutrition? This dog diet has been on the market for years, and hundreds of thousands of pet parents swear by it. While grains might not be the number one thing on the list of dog allergies, they inevitably reach the top five. Why Canines Need A No-Grain Food? 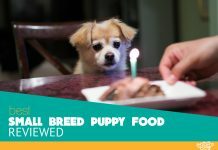 Therefore, you’ll have to cut out things like corn or wheat, to provide your pup with a long and healthy life. In today’s article, follow our step-by-step guide and discover the best nourishment for your pooch. There is a reason why Taste of the Wild is the top choice for many pet owners. Their formula has no grains, and it’s packed with probiotics to promote healthy digestion, skin, and coat. It is available in a variety of flavors, such as salmon, venison, bison mix, lamb, and wild boar. However, what makes a difference with this blend are the real roasted meat and veggies. While, sweet potatoes and peas will allow your four- legged friend to absorb all necessary nutrients. Plus, you can rely on essential vitamins, omega fatty acids, and antioxidants. To conclude, if you are in need of a recipe with all natural ingredients, featuring plenty of fruits and vegetable, then look no further. The Taste of Wile did an excellent job with this formula, and you won’t be disappointed with the results. The Core brand has a brilliant philosophy when it comes to canine’s nutrition, and they base their formulas mostly on meat. Besides being a non grain dog food, the Wellness Core Natural Deboned Turkey, and chicken meal recipe offers a couple of additional benefits. Its meal is enriched with chondroitin and glucosamine. These two compounds are famous for stimulating healthy joints and reducing risks associated with hip dysplasia and arthritis. So, if you have an energetic pup, then Wellness Core will be an excellent choice. This nourishment comes with four stomach-friendly bacteria which further boost the digestive and immune system. Overall, while Wellness Core formula is free from allergenic grains, it still contains a lot of healthy carbs which will fuel your pooch and help him maintain an active life. 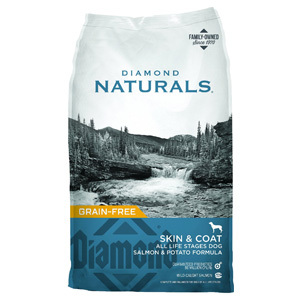 As the title suggests, the Diamond Naturals salmon and potato recipe features plenty of probiotics which will further strengthen and enhance your dog’s digestive tract. The wild-caught salmon will awake his taste buds and help him adjust to this type of diet. We have to mention that food contains top quality ingredients, including equal levels of proteins and fats. They are quite significant for skin and coat. If your mutt suffers from any uncomfortable skin conditions, then you can be sure that this formula will minimize any health issues. The combination of fruits and vegetables labeled as superfoods will leave your furry companion happy after each meal. In the end, give your pup a chance to experience pure joy with a small bag of natural goodness which Diamond Naturals provides. The Whole Earth Farms nutrition might be an answer to all your prayers. Want to know why? Well, this company only combines the most authentic and healthies ingredients mother nature has to offer. It will keep your pooch balanced and high in spirit. With no additives or preservatives, the recipe features organic components, which will stimulate digestibility and facilitate the entire process. Before we skip to ingredients, we should mention that the product doesn’t contain corn, wheat or soy. Basically, it’s a meat based dog food! Here you will find protein-rich meats such as beef, lamb, and pork meal. The mix of blueberries, sage, and thyme will cause your dogs to drool all over it. To summarize, we believe that the Whole Earth Farms will satisfy your pet’s nutritional needs, and solve his digestive issues. Including grains into a pet’s diet can be a risky business, considering some canines can be quite sensitive to it. Fortunately, The Nutro Max’s grain free large breed dog food is free of these ingredients, without compromising its nutritional value. The all-natural recipe contains pasture-fed lamb, and combined with legumes and potatoes, is a safer alternative to grains. This savory treat stays clear from soy, corn, wheat, and chicken by-products. Additionally, lamb and veggies will provide your pet with sufficient amounts of vitamins, minerals, and nutrients. Each bag is packed with omega fatty acids which will do wonders for your pooch’s skin and coat. In conclusion, if you are looking for fitting nutrition for your adult mutt, then Nutro Max should be your next pick. Canines are carnivores, and they love eating meat! It also happens to be their primary source of protein. So, when selecting proper nutrition, you have to be careful with the ingredients, especially if your pet is sensitive to gluten. Rachel Ray, celebrity TV chef turned into businesses mogul, has launched her line of dog food. This formula features real components and can be an excellent snack for your pets. The treats are packed with farm-raised beef, cheapens, potatoes, and rosemary. This grain-free product will allow your pooch to experience all health benefits, considering it doesn’t contain additives or cheap fillers. In all, once your mutt tries this high protein grain free dog food, he will never get enough of it. The taste is to die for. Over the years Merrick brand has established its name in many households. It’s one of the reasons why Merrick’s Real Texas Beef meal ended up on our list. We should also point out that this grain-free recipe is highly popular with customers. The nourishment is packed with top-rated proteins, including buffalo meat, chicken, turkey, salmon, and lamb. Additionally, well-balanced combination of fats won’t stress his digestive system. With the help of omega fatty acids, your pet will have a beautiful and groomed coat. Considering the high levels of proteins, we believe this food is excellent of active and working canines. Finally, the Merrick is one of many grain free dog food brands. However, their formulation is the cause why this company is so popular with pet owners. When it comes to formula, the first ingredient should be a high-quality protein source. Depending on your pooch, and his preferences, you can choose between beef, lamb, bison, chicken, and many others. Meat contains essential amino acids crucial for your pet’s health and improves his well-being. Because we can, dogs can digest almost anything you throw at them. Food containing carbohydrates is cheaper than nutrition rich in fats and proteins. Artificial preservatives, colors, flavors, and sweeteners can cause various side-effects, and make your pooch ill in a matter of hours. Therefore, you should be careful when choosing food for your furry companion. There are other healthier alternatives to an artificial one; you just need to explore more and find the best solution. Is your four-legged friend prone to allergies? Does he suffer from food sensitives? Well, switching to this type of diet may change that. Like humans, numerous dogs are allergic to wheat and corn, and they are commonly found ingredients in commercial dog food. On the other hand, grain-free diet will help you minimize the symptoms and prevent allergies. Have you ever thought that eating less food will keep your pet sated for a longer time? Well, it’s possible? Keep in mind that this nutrition is packed with high-quality proteins and fats, not just cheap fillers and carbs. In most cases, indigestible fibers found in corn and wheat are responsible for loose stool. Additionally, potatoes and tapioca which replace carbohydrate content in grain-free diet act as thickening agents and slow don’t the transit time through the bowls. It means your pet will not only have to go to the bathroom less frequently, but his stool will be smaller as well. As well, if your four-legged friend have similar digestive problems try switching him to dog food for diarrhea. Do you want a healthy and active canine? Well, protein is the main ingredient that fuels his body and provides more energy. The reason why no grain nutrition contains a small percentage of carbohydrates is because it balances your dog’s sugar levels and offers more strength. Grains often cause inflammation, making your pet’s skin dry, itchy and irritated. If not addressed adequately, this condition can evolve and cause you mutt to lose hair. However, wheat free dog food will allow you furry companion to have a shiny and healthy coat because it doesn’t lack oils and nutrients. A diet packed with grains may cause a lot of gases. This odor isn’t only unpleasant for owners, but for canines as well. Your pet may feel cramping and discomfort until he eventually overcomes it. Flatulence isn’t necessarily a bad thing, but it can lead to more problematic digestive issues. When your pooch eats grains, a film of carbohydrates tends to stick to his teeth. And, while the particles are washed away by your dog’s saliva, this process can take several hours. In the meantime, bacteria his mouth start to feed with the remaining carbohydrates, which creates a foul-smelling odor. However, this rule doesn’t apply to no grain food. 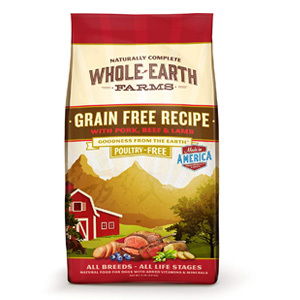 If you suspect that your pet has some allergic reaction, then grain free food might be the option you should explore. It’s a general fact that corn, wheat, and soy, are the most common allergens. Therefore, you should avoid their use in your canine’s diet. The other way is to purchase one of the best hypoallergenic foods for dogs. Considering dog has a short digestive tract, it is designed to digest animal proteins and fats quickly. On the other hand, complex carbs, such as grains, starches, and sweet potatoes are quite challenging to process. They are quickly absorbed into the blood, thereby reducing metabolic functions and affecting the immune system. This is 100% true! Dogs love their meat, and they’ll go the extra mile for it. It’ easier for them to digest proteins and fats, than fibers and carbs. That’s why corn, wheat, and soy have a negative impact on their gastrointestinal tract. Skin irritation – in many dogs, a grain allergy will manifest as irritation on the surface of the skin. If you notice your pet scratching around his face and paws, then it’s a clear indicator. Digestive issues – same as humans, canines process meat and vegetables more efficiently than grains. That’s why digestive problems such as vomiting and diarrhea might be the result of food sensitivities. Ear infection – a frequent ear infection is a common sign of grain intolerance. Typically, a single-ingredient protein would be the best solution for your pet. Limited ingredient formulas enable the pet owners to exercise the complete control over his dog’s diet. However, make sure to pick food that will satisfy his nutritious needs, and choose only natural components. While not life-threatening, allergies can cause a lot of discomforts. However, the first step to determine whether your pooch is prone to allergies is to perform testing. Unfortunately, you will have to take your mutt to the vet because there is no home test you can buy at a pharmacy. Dog food manufacturing companies play an essential role in canine’s nutrition. Nowadays, there are plenty of brands you can explore, but not all of them will offer you the same quality. The most important rule: research the ingredients before you make a final choice! Sometimes even the cheapest no grain dog food can have the best effect on your pet. As we established before, protein is a vital component of any diet. Though, with some canines, dietary proteins can trigger an unusual immune response. That’s why the process called hydrolysis uses water to break proteins into small pieces chemically. In this way, the immune system no longer reacts to them. The hydrolyzed proteins are prescribed to dogs suffering from allergies and IBD. If you notice your pooch behaving strangely, then take him to the vet immediately. Even though the previously mentioned conditions don’t pose a massive health risk, it’s better to be safe than sound. A veterinarian will perform necessary checkups and apply therapy if needed. What are the most affordable brands? The following dog food brands are budget-friendly and don’t compromising your pet’s health. Most cats don’t require grain-free or gluten free cat food. But, there are some of them who do have a need. For instance, they might be suffering from food allergies. In this case, try to find an appropriate alternative. The truth is, there is no best grain free dog food because everything depends on your pet. On the other hand, you can’t neglect the fact that canines once were wild and they used to thrive in raw meat from the wilderness. Dogs are carnivores and they enjoy meat the most. 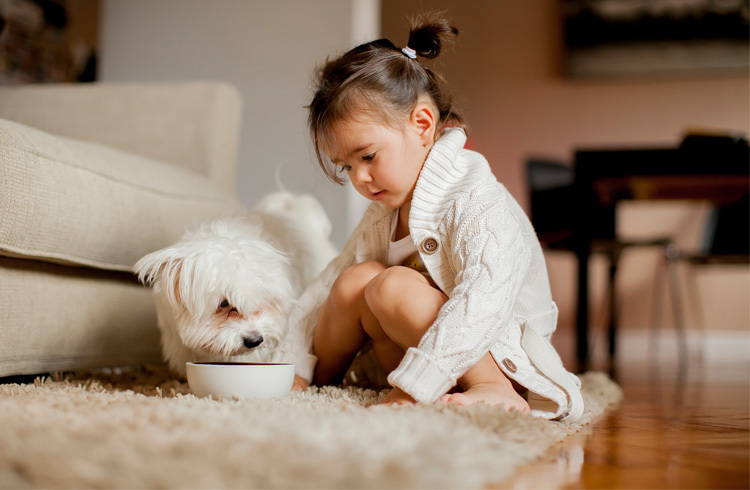 Whether you are using the best large or the best small breed dog food grain free, your pet will appreciate your effort. Ensure that protein content is not below 30% and you’ll have a vibrant and healthy pooch to spend your days with.